Last time I baked these Devon apple cakes I thought they had to be my favourite cakes. But then I say the same thing about a lot of other cakes that I bake. I am easily swayed by a moist cake full of lovely flavours. Once again I choose to bake smaller cakes rather than one big cake. I do personally find it easier to control my cake intake when they are this size. 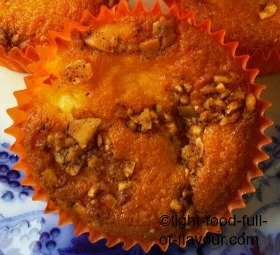 I also find that as I add a nut and cinnamon topping, these very moist Devon apple cakes don’t need any cream to accompany them. I am using xylitol in place of sugar these days. Xylitol looks and tastes like sugar but has very little effect on raising your blood sugar. 1. Pre-heat the oven to 190C/fan 170C/375F/gas mark 5. You can use individual muffin cases (chose smaller sized cases) or silicon trays - place whatever you chose on a baking tray. 2. Mix together the ingredients for the topping. Divide the mixture into 20 portions. 3. Add the lemon juice to a bowl. Peel and core the apples, cut them into cubes and toss the cubes in the lemon juice. 4. Place the butter and sugar in another bowl and whisk together, using either an electric hand whisk or an ordinary whisk, until the mixture becomes pale and fluffy. Beat in the eggs, one at a time, adding a little flour with each egg to prevent the mixture from curdling. 5. Mix together the remaining flour with the baking powder and sift into the bowl, add the ground almonds and using a large metal spoon, gently fold the flour and ground almonds into the butter mixture. Stir in the apple pieces and lemon juice. 6. Divide the mixture between the muffin cases, filling each about 2/3 full. Crumble a portion of the nut and cinnamon topping over each case and press it down lightly with your fingers. Bake the Devon apple cakes in the pre-heated oven for around 22-25 minutes – or until each cake is well risen and brown.